Quantic Dream’s Beyond: Two Souls is almost an equal parts fascinating and frustrating experience. On one hand, the story is intriguing, never predictable and at times–more often than not–incredibly touching and poignant. On the other hand, the story features superfluous elements that don’t amount to much in the grand scheme and comes unraveled in the final moments, almost undoing all of the good will earned by the highs experienced previously. One thing is for absolute certain, for all the problems the game might have, the sum of the parts is definitely greater than the whole, and all of it is anchored by a truly stellar performance by Ellen Page. The story centers on Jodie Holmes, a young woman whom has been tethered to an “entity” since birth and is haunted by other entities from the “Infraworld.” What seems like an odd choice at first is that David Cage’s script chooses for the story of Beyond: Two Souls to be told out of sequence. Throughout the course of the game, Jodie’s story jumps back and forth to different, albeit significant, times in her life, which act as vignettes. One vignette will feature Jody as a full grown woman, fussing over an impending date, while the next will focus on Jodie as a 5 year old, bored, looking for something to do in her home. If none of that sounds terribly exciting, it’s because I wouldn’t dare give away the high moments this game has, and there are plenty. Jodie’s life turns out to be an incredibly fascinating one, and by the end, the nonlinear timeline makes perfect sense, both narratively, and for the sake of pacing. The nonlinearity of the plot also serves the game’s central mystery well. While not as edge of your seat engaging as how I found Quantic Dream’s previous work, it’s still interesting to follow along and see how it all unfolds. Unfortunately, the script is somewhat clunky and grows more so as the story ramps up to its climax. Character motivations become muddled and confused, whole segments of the story seem to exist for one moment making the preceding moments seem like story fat that could have been trimmed and connections between Jodie and supporting characters can range from believable and touching, to head-scratchingly forced and out of necessity rather than good storytelling. Also, there are some late game moments and revelations that aren’t entirely earned and there are even some pretty convenient plot devices and an almost Deus ex machina piece of equipment. It’s a pretty severe turn considering the events prior and will probably derail the game completely for less forgiving players. 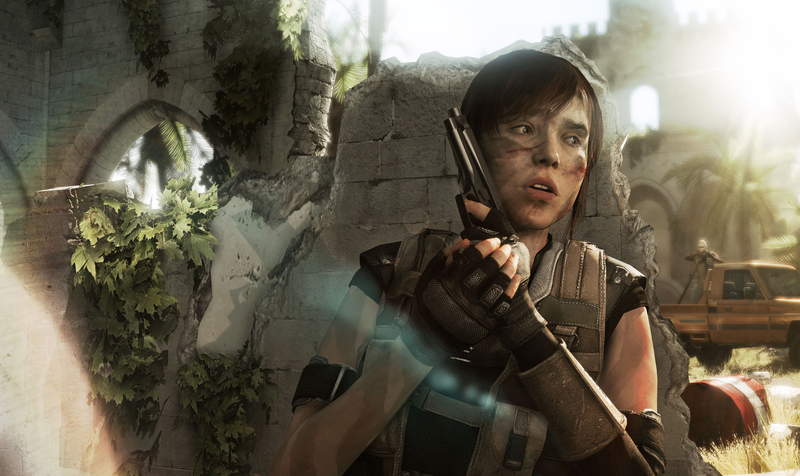 Beyond: Two Souls chronicles Jodie Holme’s life for 15 years. Along with Jodie for the ride is Aiden, the soul that has been tethered to Jodie since birth. A character in and of itself, Aiden is pretty much used for light puzzle solving, and getting Jodie out of tight spots. Controlling Aiden is incredibly simple, as using the left stick moves him forward, backwards and side to side, while the right stick controls the direction. While Aiden navigates the immediate environment , certain items or people will highlight with a small blue circle meaning Aiden can interact with it. Pressing and holding the L1 button will lock on to the specific object or person and the two thumbsticks work in tandem to perform what every preordained interaction will be. For example, pulling the two sticks down and releasing will hit the object. Pressing both sticks together on electronics will cause the electronics to turn off or flicker and so forth. How Aiden interacts with humans is in one of two ways. Aiden will either choke a person to death or posses them. Possessing someone is generally used to open a door or kill a guard with little variance. The curious thing about this mechanic, especially when interacting with NPCs, is that it’s predetermined what you can and can’t do. Red highlighted enemies can be choked, and orange glowing enemies can be possessed. The rest will be highlighted blue doing little else other than showing their position. Neither the twain shall meet. It would have been much more interesting if I could have possessed or choked an enemy and see how it unfolds. Though I suppose that isn’t the purpose of this game. That said, once I accepted that this was how the game was designed, it really didn’t cross my mind again. Controlling Jodie is a much different experience. Players will mostly move Jodie around an environment until a little white orb appears. Clicking in its direction will cause Jodie to interact with it in whatever way it’s meant to be. For example, picking up a photo can prompt an inner thought, or Aiden can be used to feed Jodie a brief memory involving the person in the photo. In other instances, Jodie may climb, shove, open various obstacles using button prompts like holding X or mashing Triangle, and so on. If you’ve played Heavy Rain, then you know what to expect here in this regard. It can also get a bit clunky, and trying to position Jodie in the right spot to get the prompt can break the immersion even just a bit. However, what is new, and actually quite well done, is how action is handled in this game. Combat pops up quite a bit in Beyond: Two Souls and the way it’s handled is actually incredibly satisfying and completely removes all the intrusive button prompts normally associated with games like this. Instead of a giant flashing button prompt, turning the game into some sort of neo “Simon Says,” the game will slow down. Once in this slow motion state, the player needs to quickly view the action and continue Jodie’s action on the stick; if Jodie is facing the right of the screen and throwing a punch, pressing the right stick towards to right continues the punch and she will land it successfully. As soon as the input is registered, time resumes its normal speed. Later moments in the game has the actions being difficult to gauge due to the camera shifting perspective quickly, but failure is easily registered by a flash of red on the screen. Regardless of success or failure, the animations in and out of slow motion are impressively seamless and actually quite thrilling. There is also some contextually, well executed stealth/action sections of the game. While not overly complex, Jodie can move from cover to cover by peering out and holding X when prompted, keeping out of view of patrolling enemies. Pressing Square when close to an enemy will cause Jodie to perform a silent take down. It’s not Splinter Cell but it works contextually in the game and offers a really well done change of pace. These moments of action and stealth are relatively few and far between, so while they never wear out their welcome, they’re also the most thrilling parts of the game. This is not an issue for me, but more action-oriented players need not apply. 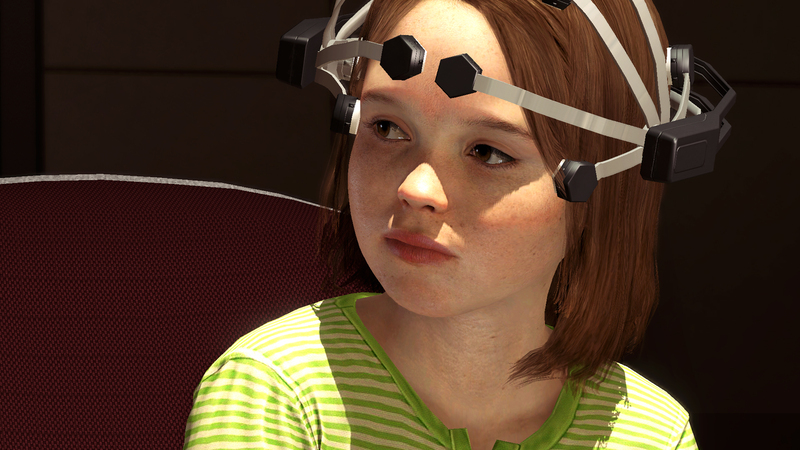 The performance capture in Beyond: Two Souls is unlike any to date. In Heavy Rain, every choice made could lead to the very real possibility that the character you were playing at the moment would die and the story would continue on without them. This is not the case in Beyond: Two Souls. Instead, choices will lead to subtle changes in how the scenes will play out. How a character might interact with you, or even how you resolve a problem. The end result will most likely remain the same, but how you arrived there can, and most likely will, be different for every player. In an early scene, a teenage Jodie, attends a birthday party at the behest of one of the workers in the lab she is in the care of. Walking around the party, Jodie can partake in all sorts of teenage party like things–dancing, drinking, even smoking weed. I never played this how I would do it, but instead I would read Jodie’s behavior and facial animations and proceeded based on those readings. In my story, sensing her deep desire to fit in and be “normal” Jodie cracked a beer and smoked a little weed. She also danced by herself because she is comfortable doing so having spent most of her life alone, and without kids her own age. To discuss what happens at that party would be a major spoiler and I wouldn’t dare, but I am curious to discuss what other players did and why after the turn of events in the game. I also want to go back and see how it plays out when choosing different options. What I do know is that at the end of the game, my Jodie was truthful, straightforward, angry, forgiving and flawed. Amazingly, Ellen Page’s performance is so good that no matter what you choose, it feels like that was the way it was supposed to go because every single line reading was organic and natural. Why the unfortunately weak finale of Beyond: Two Souls didn’t do too much damage to my overall feelings with the game is because of a fantastic performance by Ellen Page as Jodie as well as the fantastic performance capture work by the team at Quantic Dream. Together they have created what might be the most believable character in a video game. All of Jodie’s turmoil, fear, pleasure, nervousness, and all of her emotions are conveyed convincingly and genuinely, which is no small feat considering how preposterous some chunks of the story can be. In fact, I was genuinely moved during portions of the game in which Jodie suffers emotionally through the cruelty of others. Page and Quantic Dream deserve accolades for what they’ve accomplished here and Sony should be doubly proud for released two games in the same year with this level of video game performances, with Beyond and a bit earlier with The Last of Us. Video games as a story telling medium have really arrived. The days of accepting horrible voice work in video games should be over. The entire game is anchored by a stellar performance by Ellen Page. In fact, I can say that about nearly every aspect of the presentation in Beyond: Two Souls–the presentation is incredibly natural, organic and seamless. It’s truly a technical marvel in video and sound design, as nothing ever seems out of place. All of the performances are pretty spectacular and conveyed with real emotion despite their CGI nature. The gameplay is rarely intrusive and at times genuinely inspired. The gameplay is never difficult, puzzles never challenging or vexing, and “failure” only really amounts to the game playing out slightly differently. If the player is looking for a challenge or an actual game in which the player wins or loses, then Beyond: Two Souls is not for them. If you are, however, interested in the many different ways this medium can be used to tell stories, and in seeing how far performances have come in video games then Beyond: Two Souls will more than satisfy. It’s not perfect, frustratingly so. 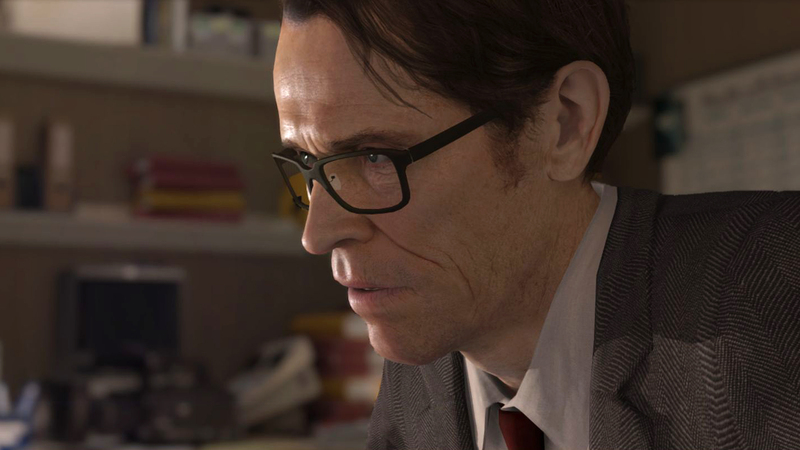 Despite the severely lacking third act and some superfluous story segments, it managed to both engage me emotionally with its incredible performances and turn me off intellectually with its increasingly suspect “science.” As a fan of the medium, I appreciate fully what David Cage and Quantic Dream are trying to do, and as such I can overlook the Beyond: Two Souls‘s flaws in light of all of the ambition and things they get right. Sean finished Beyond: Two Souls in approximately 12 hours and received 30% of the trophies. The copy of the game played for review was rented.